You can save up to 12 designs (or 512KB) in the Brother SE400’s permanent memory. This is handy for saving special words or designs you’ve customized so that you can use them again, even if you turn off the machine. When you’re finished with a design or need more room, you can easily use the touch screen controls to remove designs you don’t want anymore. Here’s how. 1. 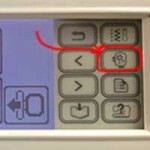 From the embroidery Home Screen on the control panel, press the Retrieve Key. 2. You will see the designs you’ve saved. Navigate to the design you want to remove with the Next (>) button. 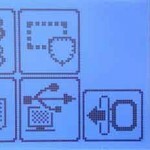 Select the Design and Press DELETE. 2. Select the design by pressing its image. YOU are a big help. Thank you for your work. eu tenho uma pe 700 ha algum tempo agora resolvi bordar e nao consigo transferir o bordado p o cartao. preciso de um cartao novo. como faço p comprar? My bobbin thread keeps sewing on top of my design, what do I do please. Thank you soooo much!!! I have had my machine a few months now but have been a bit intimidated I am so glad I found your page. I have a model HE-240 machine and I have followed your instructions and it did not work. What is the problem? I just got my Brother PE525 and downloaded two designs but I want to delete them and I have followed your instructions and it did not work what is the problem? Kamala, I am unable to download embroidery fonts from my laptop to my machine. Do I need a memory stick to do this? Please give me step by step directions if I can do this without the memory stick. If I do need one, do you have advice on places to purchase those. Thanks!